Republished from fake is the new real. By Neil Freeman, artist and urban planner. 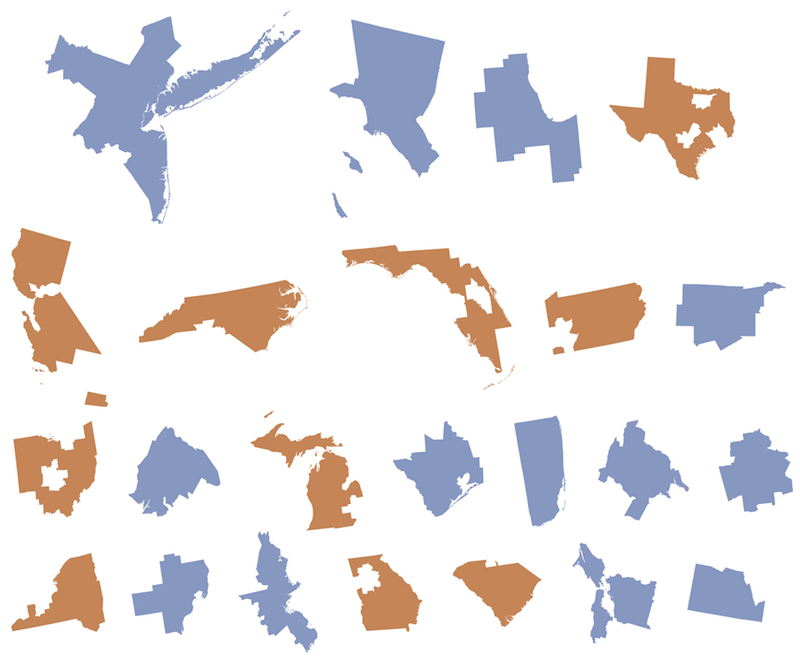 The fifty largest metro areas (in blue), disaggregated from their states (in orange). Each has been scaled and sorted according to population. The metro areas are US-Census defined CBSAs and MSAs. Small sampling below. Click on image for all 100 shapes. Do you know of any good tools for converting a map’s graphic scale bar measurement to a representational fraction (RF)? Please share them! We often think of maps as 1:24,000 or 1:1,000,000 natural scale but more often than not a scale bar is the only indication of scale we have on a map. How to convert that back to the more familiar representational fraction? What are the features and interface you’d like to see for such a tool? 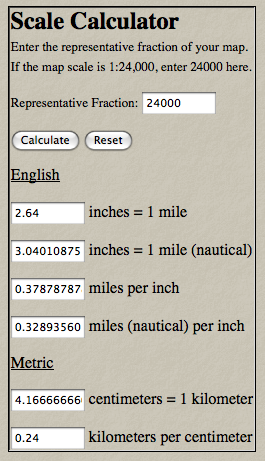 Type in the number of units per distance (or distance per unit) and it’ll return the relational fraction. It does not do a very good job allowing you to type in both the units and the distance as variable. I hardly ever find scale bars on maps that are exactly an inch long. So involves some pre-math to get this tool to work. 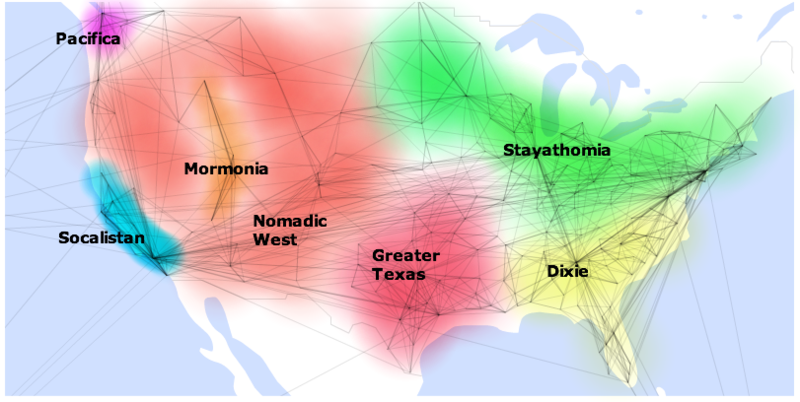 Enter the representational fraction of the map and get “1 inch = X miles” verbal statements where the left and right terms do not have the same units. Then there is the general problem of converting between map units. Type in “convert 12 miles to km” and it will return the conversion. Read more about map scales. Some example map scales and worked formula examples from Richard Layton (source). SOME COMMON SCALES. Here is a list of RF scales commonly used in the Map Collection and their equivalent Verbal Scales. 1:24,000 - 1 in. = .379 mi. 1:62,500 - 1 in. = .986 mi. 1:100,000 – 1 in. = 1.578 mi. 1:250,000 - 1 in. = 4 mi. 1:500,000 - 1 in. = 7.891 mi. 1:1,000,000 – 1 in. = 15.783 mi. For example you want a map of Arizona on a 8 1/2 x 11 inch piece of paper. To allow for 1/2-inch margins the new sheet will then be 7 1/2 x 10 inches. Since Arizona’s north-south dimension, 395 miles, is slightly longer than its east-west dimension, 340 miles, we will place the longer north-south dimension along the longer 10-inch dimension of the paper. The next step is to compute the scales for both dimensions of the State. The smaller of the two scales will be the one we need. We therefore need a map of Arizona at a scale of 1:2,872,320 or less to place it on an 8 1/2 x 11 inch sheet of paper. 1:2,000,000 to about 1:250,000 are SMALL-scale maps. Items on these maps appear small (e.g. a county on a 1:2,000,000 map is much smaller than on a 1:100,000 map). pretty much in the middle – intermediate scale. America’s natural-gas boom is driving the construction of thousands of miles of new pipelines, many of them crisscrossing heavily populated or environmentally sensitive areas. About 4,400 miles of new pipeline will be built this year, according to government projections. That is more than 2.5 times last year’s figure and the biggest annual addition in the 10 years data have been collected. The new pipe will carry 47 billion cubic feet per day of natural gas, triple the amount carried by new pipeline in 2007, itself a record year. The construction of highly pressurized lines snaking under farms and past residential areas is raising fears about safety and environmental impacts in communities along the new pipeline routes. Companies building the pipelines face lawsuits, eminent-domain battles and jurisdictional fights among the local, state and federal authorities that oversee the projects. Two New England projects have been held up or canceled in recent months because of local opposition. Even energy-friendly Texas has seen growing opposition to some projects in Fort Worth. “The greatest need is in the most densely populated areas, which in turn are the most challenging places to site infrastructure,” said Robert Cupina, principal deputy director of the Federal Energy Regulatory Commission office that oversees pipeline construction. The pipeline boom is being driven by the need to distribute growing natural-gas production to markets across the nation. The U.S. is increasingly relying on natural gas as a fuel that is cleaner than coal, much cheaper than oil — albeit not as cheap as in past years — and, unlike most renewable alternatives, readily available. Natural gas generated 20% of U.S. electricity in 2006, up from 13% a decade earlier. Demand for natural gas could grow even faster if Congress passes new limits on carbon emissions, or if it becomes more popular as an alternative to gasoline, as Texas oilman T. Boone Pickens has recently proposed. Continue reading at Wall Street Journal . . .